As Christians, we need to pray for one another. Prayer is essential for our wellbeing as human beings. Jesus Christ himself teaches on the efficacy of persistent prayer in Luke 18. In his letter, St James equally writes on the efficacy of prayer. In this letter, we see that the prayer said in faith makes an impact; it brings down God’s blessings upon us. Confer James 5:16-18. Just like the living have need of prayers so too are the dead. This is why, as Catholics, we constantly pray for the living and for the dead. The Holy Mass, the highest form of prayer, is offered daily for the living and the dead. 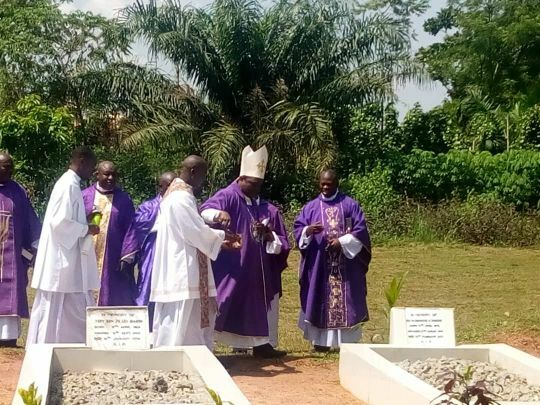 Every year, the Diocese of Uromi remembers and prays for deceased Priests and Consecrated Persons who worked in Esanland (as evangelizers) on the second Tuesday of November at the Brother Roman Catechetical and Revewal Centre, Ekpoma. For this year 2018, the Holy Mass for these beloved servants of God took place on Tuesday, 13 November. The Mass which was presided at by the Chief Shepherd of Uromi Diocese, Most Rev. Donatus Ogun and concelebrated by his priests was well attended by consecrated persons and the lay faithful of the Diocese. The celebration included visit and prayer at the Cemetry within the Centre where some of these servants of God were laid to rest. The celebration this year is the third since the beginning of the Episcopacy of Most Rev. Donatus Ogun as Bishop of Uromi Diocese. The faithful of the Diocese is grateful to the Bishop for instituting this Remembrance Day for deceased Priests and Consecrated Persons who worked in Esanland. May God bless him abundantly for the leadership he is providing in the Diocese.